This is yet another Boot-Manager which I almost did not change since 1999 (written in ASM/C). The difference to most other Boot-Managers is that it does not need any other partition - it is stored in the usually unused sectores between the MBR and the first partition (there is about 32KB I believe). I use it by myself but I have to admit it is not the best of the best... and probably one of the major downside is the installation... every windows user who never heard of DOS should run away in fear. The Boot-Manager consists of two parts... _bootmgr.com - the Boot-Manager itself, and mbr.bin - the MBR (Main Boot Record) which will load the Boot-Manager but works as a regular MBR as well (in case something is not working). So what you have to do is to write mbr.bin to the very first sector and _bootmgr.com to the following sector (offset 512/200h). This can be done with any tool you might have but I offer one of course. Save this file to your boot-disk with all required tools for emergency - even though I doubt there will be... it is for your own safty. You could later call _r_mbr.bat and _r_ubp.bat which will restore certain sectors using partcopy. You may either call _w_mbr.bat and _w_ubp.bat or writembr.exe and writeubp.exe - they do almost the same... the later just do some more checking. If you now restart your system you should see the Boot-Manager. And because I was concerned about safty your system should start normal when it could not start properly before (you could also press ESC when you see the screen to trigger the regular boot process). you can then add new configurations by pressing INS or modifying by pressing F4. There you can choose the partition you want to start from by selecting the partition with the UP/DOWN-key and then pressing SPACE. 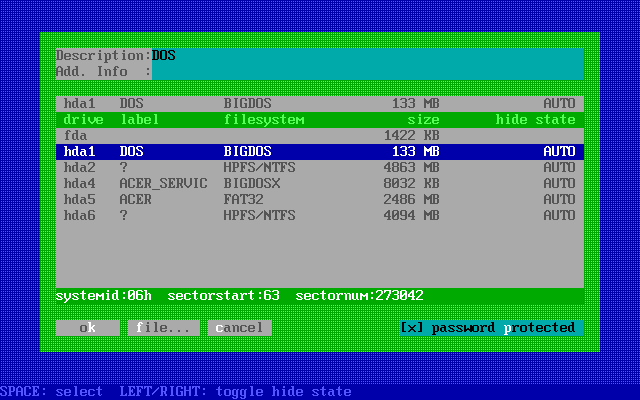 The partitions are maybe hidden/unhidden automatically but you can change this by pressing the RIGHT/LEFT-key. 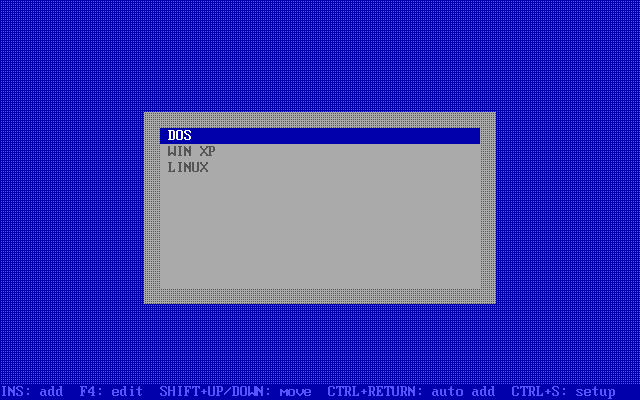 In addition you may also want to choose a file which contains the boot-record of a operating system which shares it's partition (like DOS/Windows might do). The last option option let you choose whether this configuration is password protected or not... the password can be set in the Setup-Menu by pressing CTRL+S in the Main-Menu. There you may also set after how many seconds the last configuration should be started automatically (pressing any key interrupts this). partcopy.bat - calls pcopy_d.exe or pcopy_w.exe depending on environment variables.